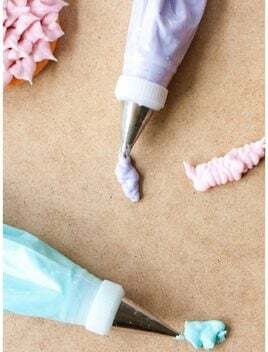 Quick, easy cherry frosting recipe (creamy cherry buttercream)- Made with 4 ingredients: butter, sugar, maraschino cherry juice, extract. Perfect for piping. This maraschino cherry frosting just screams Summer. It’s fruity, silky smooth, creamy and has a beautiful pink color. 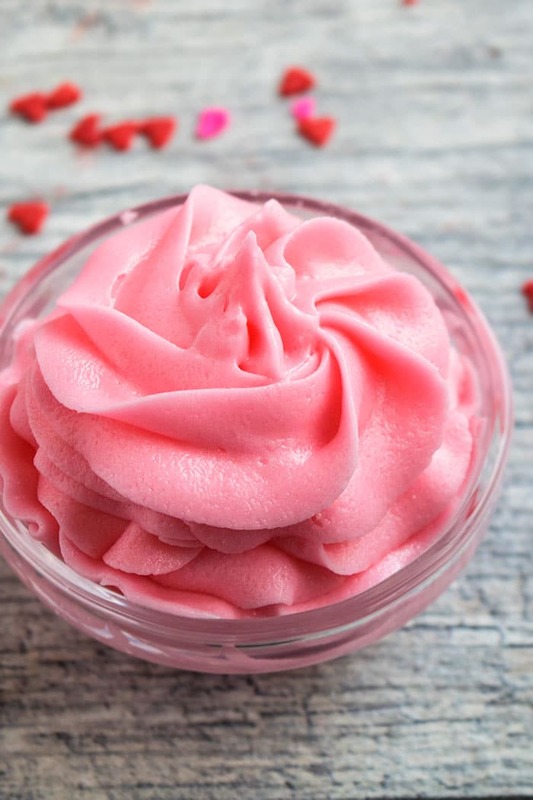 You can also use this cherry frosting for cupcakes, cakes, cookies, brownies and bars. 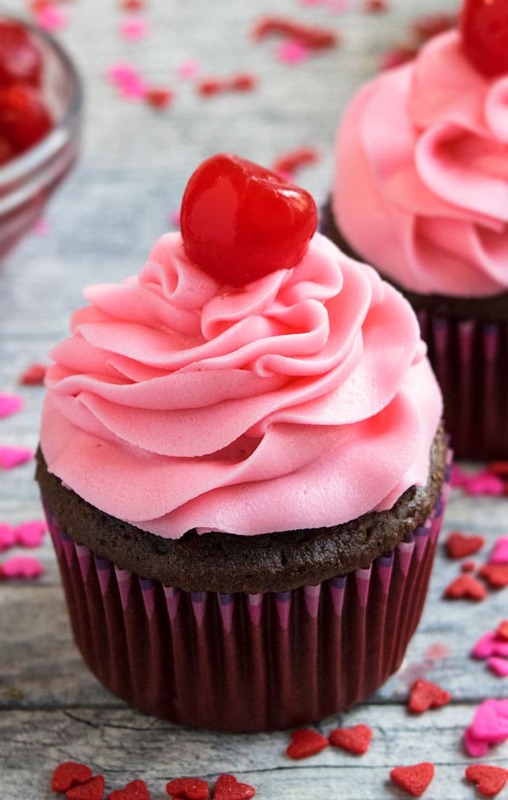 How to make cherry frosting from scratch? Add some powdered sugar and mix until frosting starts to become thick. 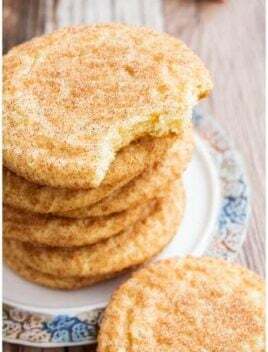 Mix in cherry juice, almond extract and more powdered sugar until frosting is smooth and creamy. 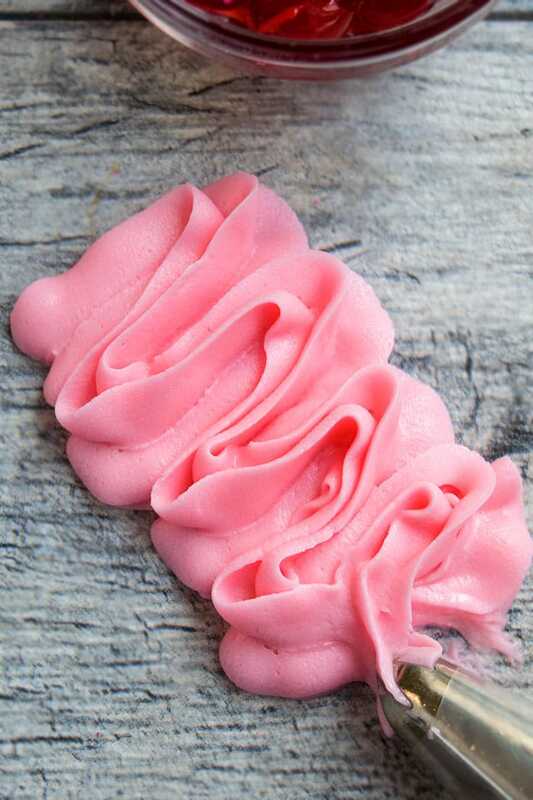 Cherry buttercream frosting is made with 4 ingredients! A great way to enjoy this frosting is on my sugar cookies. Cream Cheese Cherry Frosting– Cream together 8 oz cream cheese with the butter and add mix in powdered sugar until frosting thickens to your desired consistency. More powdered sugar will be needed that what’s written below in the recipe card. 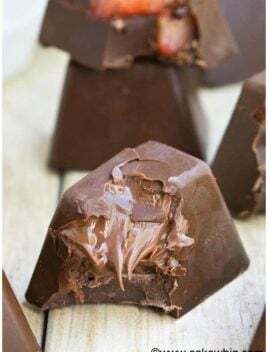 Cherry Chip Frosting/ Chocolate Cherry Frosting Recipe– Stir in 1/2 cup mini chocolate chips in the prepared frosting at the very end. 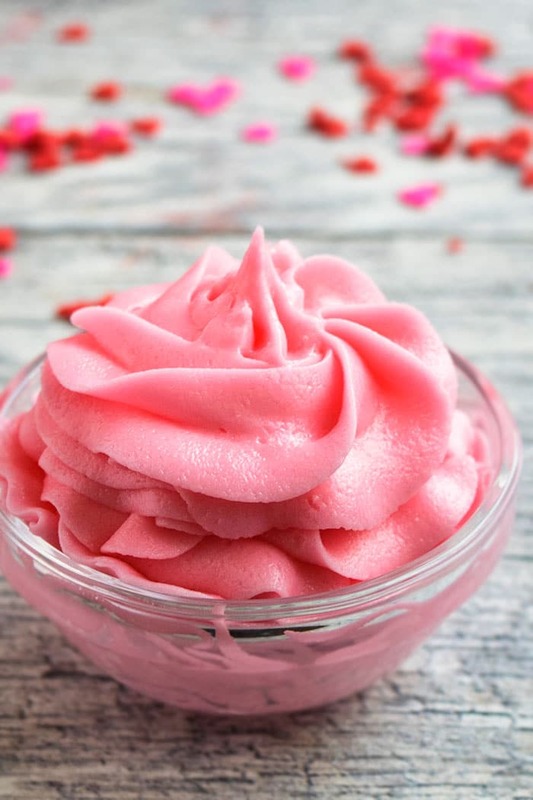 Fresh Cherry Frosting– Puree fresh cherries in a blender and run it through a fine sieve and use this liquid instead of maraschino cherry juice. 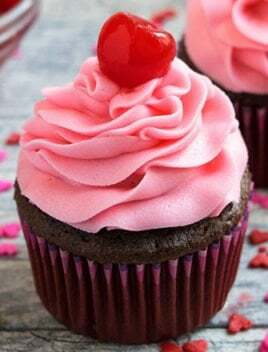 Black Cherry Frosting– Puree black cherries in a blender and run it through a fine sieve and use this liquid instead of maraschino cherry juice. Frozen Cherry Frosting– Puree frozen cherries in a blender and run it through a fine sieve and use this liquid instead of maraschino cherry juice. If frosting is too thick, thin it out by mixing in some cherry juice (1 tsp at a time). If frosting is too thin, thicken it by adding more powdered sugar (1/4 cup at a time). 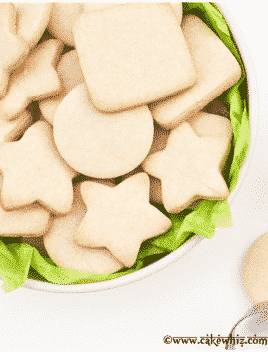 Use unsalted butter to prevent frosting from becoming too salty. All ingredients must be at room temperature because they will blend together more smoothly. Frosting is enough for icing 24 cupcakes or filling and icing an 8 inch round cake. Almond extract has a strong flavor. Use it sparingly. You can stir in finely chopped maraschino cherries in this frosting but it becomes very difficult to pipe it since the cherries get stuck in the piping tip. However, you would have no issues if you are spreading frosting on cakes/cupcakes with a spatula. Add pink gel coloring to enhance the pink color. Mix in cherry juice and almond extract. And more powdered sugar and continue mixing until frosting becomes smooth and creamy. Enjoy! Love me some frosting! 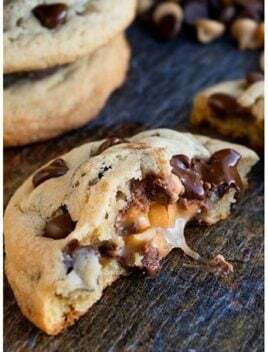 This sounds delish!!! 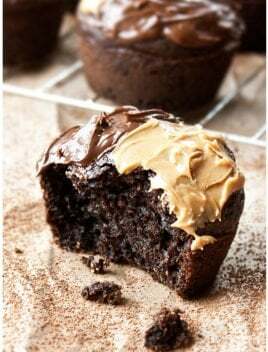 This look so tasty and easy to make!